Yvonne Craig, the actress best known for playing Batgirl in the 1960s Batman TV series, has died at the age of 78. "In the end, her mind still wanted to fight but her body had given up," her family said in a statement. A trained dancer, she began her career at The Ballet Russe de Monte Carlo and used those skills to perform her own stunts alongside Adam West's Batman. And she starred in two movies opposite Elvis Presley - It Happened at the World's Fair and Kissin' Cousins. 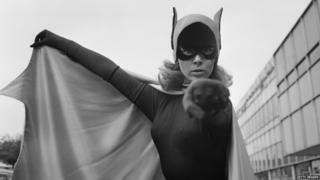 She joined the TV show in its third and final series in 1967, thwacking and kapow-ing Gotham's bad guys alongside Batman and Robin. "I really didn't think we were mak­ing Gone With the Wind," she said. "Just an episodic TV series that would be over when it was over and then it would never rerun again. "I meet women today who tell me that they grew up viewing Batgirl as an important role model. If they choose to know me in that context, well, I'll take it." In the statement on Craig's website, her family said: "Yvonne excelled in ballet, a film career, a business life, as well as in philanthropic and charity work over the years. "She had been able to do this with joy and much laughter and she wouldn't have changed a thing. Well, maybe one thing and that would have been not to get cancer. "She had been in chemo almost continuously for the past two plus years since being diagnosed and that had weakened her immune system as well as her body.